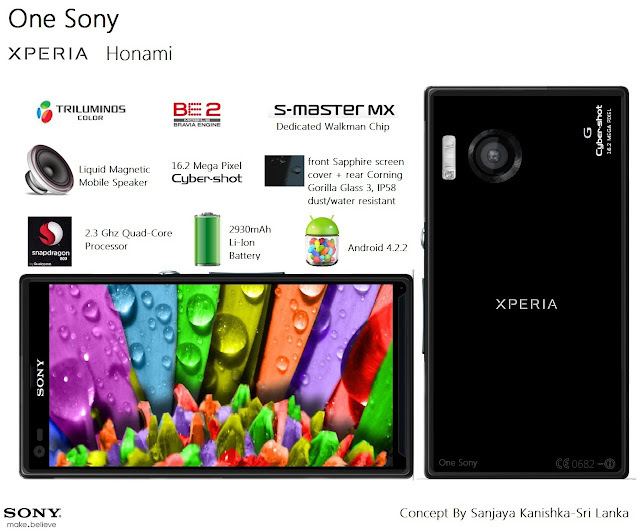 Few days ago we heard the rumor about a upcoming Sony flagship device which is known as "Xperia Honami". 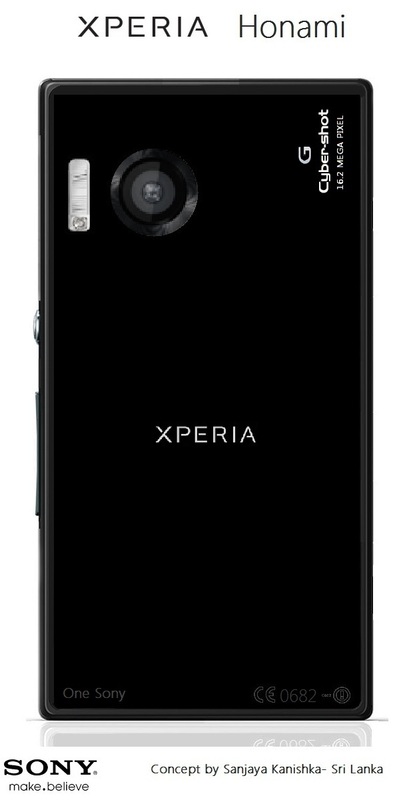 There was another rumored model "Xperia Togari" a 6.4" phablet to come out in the 2nd half of 2013. Sony also introduced a new Series of product lineup named "One Sony" where people can get the best out of Sony's latest technologies in a single product. The Xperia Honami is expected to follow up the One Sony line. The Concept here i made is based on some rumored specifications and some of my own guessed hardware features. Xperia Honami is the competitor of HTC one and Samsung Galaxy S4. Some users are not quite satisfied with the screen quality of Xperia Z, but the successor to the glassy giant, Xperia Honami is based on a different screen technology and more tougher materials.Introducing Xperia Honami. The front side of the phone is covered by a Sapphire cover glass,simply the toughest materiel a smartphone manufacturer can use since it's second to diamond in toughness. Aluminium Oxide compounds on the cover gives ultra toughness and scratch resistance to the device. At the bottom ,we can see a long grill for liquid magnetic speakers. Honami is similar to the Xperia ZL by covering a large amount of area for the display. Here we are dealing with a 5" edge to edge 1080p Trilunimos screen. With this, the panel could produce more natural colors by placing a filter between the white LED and the panel converting it to RGB lighting.It uses the highest color spectrum on a screen. The back side of the device is covered by a Corning gorilla glass 3. now you will think why didn't i use the same sapphire cover to the back as well. Well, that can make the phones price little bit higher and we really don't encounter with the rear side. Xperia Honami use a 16.2 Mega Pixel Exmore RS stacked sensor, Sony G lens , next gen Cyber-Shot camera along with a Xenon flash. Will they really use a G lens or will use a Carl Zeiss lens? as reports says, Sony is planing to fire it's best weapons this time to the market. Assuming these facts we can pray for a Cyber-Shot camera. Xperia Honami will be an awesome device if the rumors are true. 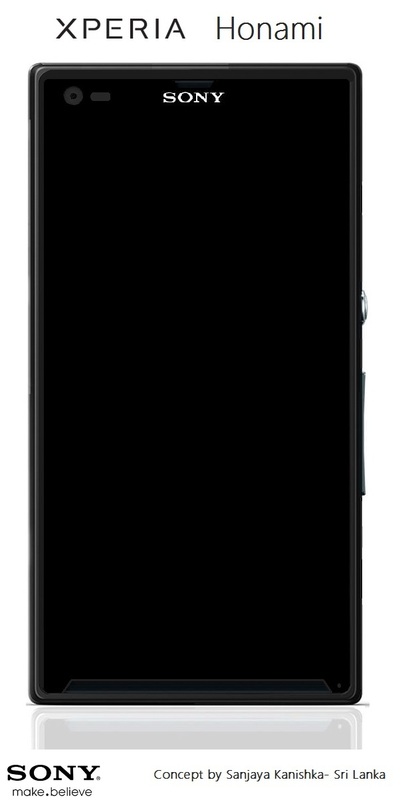 There is a possibility ,Sony could bring back the white magic screen to here and floating touch. the specifications can go head to head with upcoming Galaxy Note 3 as well. in terms of durability Xperia Honami is the toughest smart phone and it's IP 58 certified. which means it has more resistance to water and dust when compared to Xperia Z. Qualcome also said they will launch devices with Snapdragon 800 chipset in the second half of this year. Dont forget we have Nvidia Tegra 4 also, both chipsets are waiting for there debuts and go head to head in the smartphone arena. The battle between smartphones will never end. A conflict between latest technologies to give human the best out of best.